Plugging in your phone to charge it is sooooo 2012. That's why more and more automakers are investing in wireless charging for your devices when they're in the car. Karl Henkel over at the Detroit News reports that General Motors just inked a deal with Powermat Technologies Ltd. — whose products can charge the batteries of various devices without a need for a plug — to put wireless charging on some 2014 cars, staring with the Volt. GM has a $5 million stake in Powermat. As Karl notes, they're not the first to do this. Toyota already offers it on their Avalon, and it's a Mopar option on some Chrysler cars too. This could be the next big thing in cars — for your phone, at least. 2nd Gear: The Acura TLX Will Be Smaller, But Will Anyone Care? Acura, a company whose strategy has long consisted mostly of selling Really Nice Accords, will kill off the TL and TSX Really Nice Accords next year for a smaller, lighter Really Nice Accord called the TLX. Automotive News reports that the aged TSX, once an enthusiast favorite and probably the last great Acura for people who care about driving, will be discontinued in order to use the newest Accord platform in all markets. The new TLX will slot in between the current current TL and TSX sedans. The TLX will get the 310-horsepower Earth Dreams V6 from the RLX, also a Really Nice Accord, and will come with available all-wheel drive and all-wheel steering. I dunno, Acura, it sounds like a Really Nice Accord, but how well has that worked for you lately? Hyundai's workers in South Korea are staging a strike this week for higher wages and benefits, but just a little bitty one. The Detroit News reports 46,000 workers in Seoul will strike for four hours over two days. Hyundai has been having labor issues in their home country as of late. Labor strife has dragged down earnings at Hyundai and its Kia affiliate after unions elected hard-line leaders. Earlier this year, Hyundai workers refused to work overtime for three weeks. That resulted in lost output of 83,000 vehicles worth 1.7 trillion won ($1.5 billion), according to the company. In 2012, the maker of the Elantra and Santa Fe estimated it lost production of 82,000 vehicles worth 1.7 trillion won due to 92 hours of walkouts. Automotive News reports that what GM CEO Dan Akerson calls their "flanker brands," Buick and Opel, will become more closely tied together product-wise to bolster sales and profits for both brands. A big part of that is the Buick Encore mini-SUV, sold in Europe as an Opel Mokka. Any chance we can get the Opel Adam in America, then? My crazy plan will work, I promise! 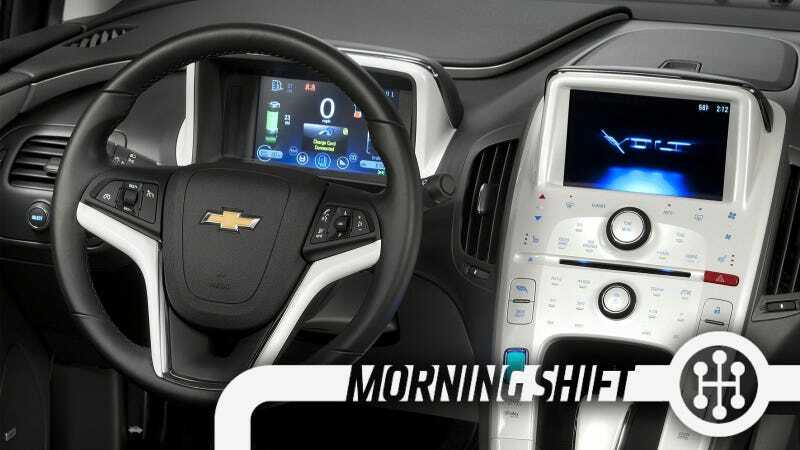 The small SUV, sold in Europe as an Opel and in China and the United States as the Buick Encore, represents what General Motors CEO Dan Akerson is pushing GM to do more of with the two brands. By working together, they can hold down costs and carve out a profitable niche between upscale Cadillac and mass-market Chevrolet, the company's global brands. [...] "This Buick-Opel guiding principle of similar if not identical vehicles is the right thing to do," Jim Federico, a GM executive director in product development, said last month in an interview. "It makes it extremely clear for brand identity for Chevrolet and Cadillac and these can fit nicely in the middle. The new 2014 Corvette Stingray seems to be an impressive piece of kit, and GM is now seeking a different kind of buyer for it than the Corvette's typical middle-aged bald guy. The Detroit Free Press has a report on what they're aiming for. Apparently, people have been canceling orders for Ferraris to order the Stingray instead. Has anyone out there heard if that's really the case? The average age of a buyer of the current Corvette has been climbing each year and now is in the high 50s. It wants more of the upwardly mobile buyers in their 40s and even younger looking to reward themselves. Plus, Corvette attracts more blue-collar customers than other sports car brands. Nothing wrong with that, but it does mean that more buyers have to stretch their budgets for one. General Motors wouldn't mind having more fans rich enough to pick up a sports car on a whim, and take the top of the line. "We want more wealthy people buying the car," says Tadge Juechter, its chief engineer. Pre-orders are encouraging: "Now you've got some people with Ferraris canceling their order" to buy a Corvette. On August 20, 2004, 83 tow trucks roll through the streets of Wenatchee, Washington, in an event arranged by the Washington Tow Truck Association (WTTA). "The Guinness Book of World Records" dubbed it the world's largest parade of tow trucks. Neutral: On the smartphone-centric nature of modern cars When I drive new cars, it never ceases to amaze me how much they cater to your smartphone, or how much their systems try to emulate the functions of smartphones. The device has truly redefined the automobile. Is that good or bad?